Win McNamee/Getty ImagesPresident Donald Trump made it clear that his criticism of the NFL is not going away. 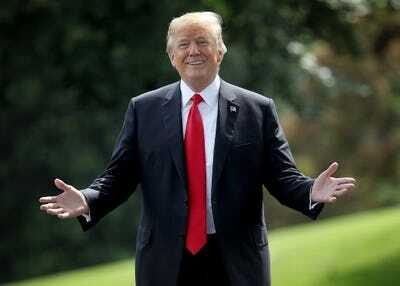 More importantly to the future of the NFL, Trump made it clear that he is not going to stop criticising the league over protests during the anthem, despite attempts by the league to appease the president. When the NFL approved its new policy requiring players on the field to stand during the national anthem, it was easy to see a path to a nightmare scenario for the league in which it angered its most important partners – the players – and failed to accomplish its most important goal – appeasing President Donald Trump and his base. 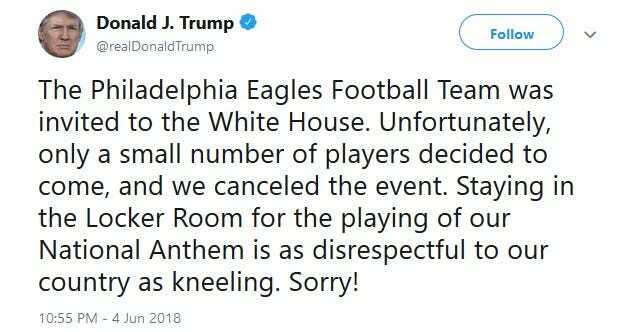 On Monday, Trump disinvited the Philadelphia Eagles from their planned trip to the White House to celebrate their Super Bowl win. The move was made after it became clear that the number of players in attendance would be quite small – possibly as few as two. More importantly to the NFL’s future, it is now clear that Trump is not going to let up on his criticism of the league and its players, despite the new anthem policy – one which, by the way,Trump celebrated with a victory lap when it was first announced. While the NFL tried to give the players a method of protest that did not involve kneeling, the optics of players staying in the locker room might actually be worse. This would become apparent if one team is on the field for the anthem and the other is in the locker room – or if half the players from both sides are on the sidelines and the absence of others is obvious. Critics could also look at staying in the locker room as even more disrespectful as it could be perceived as “ignoring” the anthem. 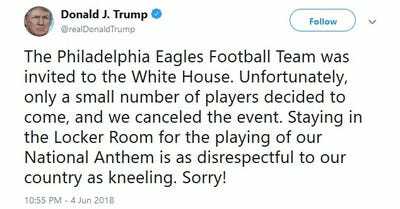 Still, the link between staying in the locker room and the Eagles’ trip to the White House is not clear, as no Eagles players kneeled during the 2017 season. But in making the connection anyway, it was clear Trump wanted to keep the anthem issue on the national radar. According to a sworn deposition reviewed by The Wall Street Journal and given by Dallas Cowboys owner Jerry Jones during Colin Kaepernick’s collusion case against the NFL, Trump made it clear that the anthem policy was vital to him and his supporters. With plenty of controversies engulfing the White House, there was no reason to believe that Trump would suddenly drop an issue that “lifts” him. And yet, some in the NFL admitted that the wrath of Trump’s Twitter was a significant factor in the new policy. Green Bay Packers president Mark Murphy laughed when asked by Albert Breer of Sports Illustrated if Trump’s reactions influenced the owners. Trump “certainly initiated some of the thinking, and was a part of the entire picture,” Jones told Breer. On top of all this, the league further angered fans who support the players’ rights to protest peacefully, especially in stadiums that are often publicly funded. In 2018, that’s the worst kind of nightmare.